I should say, first of all, that this is not a political post; I believe that we should all Reduce, Reuse and Recycle. 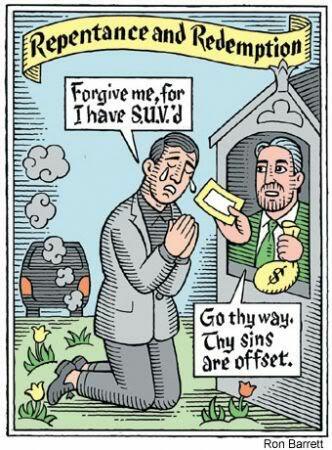 What this is about, however, is guilt and the new way (supposedly) to buy one’s way to a clear conscience: Carbon Offsets. 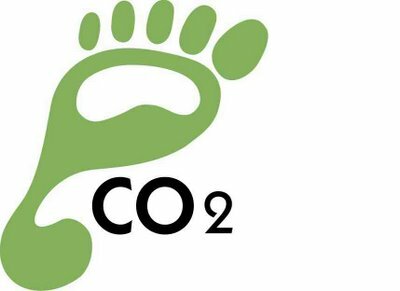 For those of you not familiar with the concept, there is a way to measure how large your “Carbon Footprint” is–how much CO2 you help inject into the atmosphere–and Carbon Offsets place a monetary value on the size of that footprint and then allow you to invest in organizations and technologies that can offset your usage. For instance, on the website Terrpass.com I calculated that I use 12,000 lbs of CO2 a year and for a mere $71.40 worth of Carbon Offsets, I can rest, nestled peacefully in the bosom of Mother Earth . . . sounds like a deal. What is interesting about this concept is not the validity of or even necessity for reducing greenhouse gasses, but the way, for many, the Environment has taken the place of God in a worldwide search for absolution. Johann Tetzel’s (the friar most famous for selling indulgences in Luther’s Wittenberg) famous jingle, “Every time the coffer rings, a soul from Purgatory springs,” has been replaced with, “Every time you must fly in a plane, buy Carbon Offsets to ease your pain.” The irony of all this is perfectly summed up by one line from the Wikipedia entry which states, “Offsets may be cheaper or more convenient alternatives to reducing one’s own fossil-fuel consumption.” Indeed. What we have here is a complete return to the Medieval penitential system where everyone knows that you can’t be perfect–in this case actually change your overseas travel plans, turn off your air conditioner, stop using Axe body spray, etc.–so, in light of “being human,” there are ways of getting around these facts of life while still sacrificing enough to get into, or in this case contribute to the idea of helping build, heaven. Of course, these are just the lowly, carnal people who take Terrapass.com up on their $71.00 bribe, the real Enviromonks only eat out of trash cans (Freegans), look down on people who use hot water, plastic bags and, of course, pay homage to the Enviropope: Al Gore. Read the follow-up post, “It’s Not Easy Being Green (or Totally Depraved)” here. One of the best posts I've read in a long, long time. Thanks Jady. Yes! Intrinsic justification meets the Bay Area! Love it Jady! Thanks man. I love the Hulk picture. The unsuspecting man in a headlock from a green monster.